The Irish crooners, who are releasing new album BZ20, told Metro they didn't even want to take on former rivals Take That. 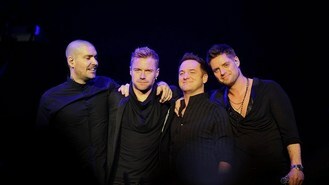 Frontman Ronan Keating, 36, said: "We're not here to compete. We've never really been in competition with any other band, that's not our attitude." Mikey Graham, 41, added: "As far as competition with other bands like That That, they're just getting on with their own thing. "We're just all in the same industry, we're not by any means in competition like kids might be today wanting to get a number one, we've long passed that point." Shane Lynch, 37, said that their seven-year break from 2001 helped them return with a new perspective. "All the bulls**t is gone, that's the bottom line," he said. " When we were 16 or 17 years old trying to understand who we were and just growing up (in the industry) it just gets silly." "Going away from all that and coming back years later as established men, family men, the nonsense is gone and it's a great friendship that we have."